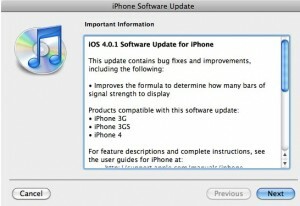 Apple finally released iOS 4.0.1 software update for iPhone 4, iPhone 3G S and iPhone 3G. The iOS 4.0.1 (build number 8A306 ) is a special iPhone only update that fixes the issues related with wireless reception. 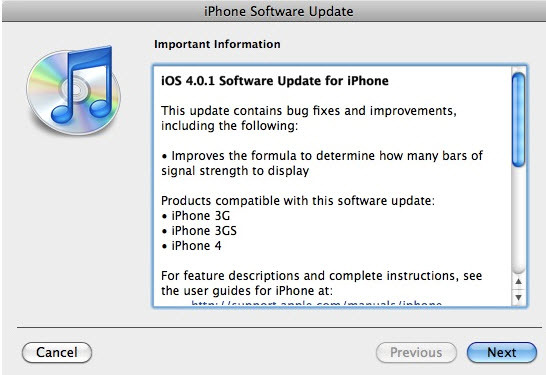 The official changelog indicate that the iOS 4.0.1 corrects the wrong formula, that is being used in iOS 4.0 to calculate the signal bar strength. Even though, iOS 4.0.1 will not fix the antenna reception issue, which is a part of the iPhone 4 hardware. We hope that Apple would announce a solution for the hardware issue – at the press scheduled for coming Friday. Those who are interested can download iOS 4.0.1 from the direct links given below. The official update through iTunes is always not possible for people using slow broadband connections. These links give below will hep them to download iOS 4.0.1, and backup the standalone ipsw for future use. 1. Download the iOS 4.0 ipsw from the direct download links. 2. Get the latest version of iTunes for Windows or Mac. 3. After download, Open iTunes and select the idevice from left plane. 4. Now click on shift + restore (Windows) or option+ restore (Mac) and browse to the location of iOS 4.0 ipsw. Let iTunes to finish iOS 4.01. installation. Download iOS4.0.1 ipsw for iPhone 4 here. Download iOS 4.1.1 ipsw for iPhone 3G S here. Download iOS 4.01. ipsw for iPhone 3G here. Note that some of the features of iOS 4.0 are not supported in iPhone 3G. Updated: Apple released iOS 4.1. Direct download links are available here.